As fall semester began, bringing with it our largest-ever population of enrolled students, we decided it was time to test the social media waters at UM-Flint. The vehicle: the Welcome Back Picnic on September 16. We’ve been putting a lot of careful thought into our social media initiatives this year. Have our efforts been paying off? Would it be possible to engage students in social media during a day-long event on campus? We want students (and the community at large, really) to view Facebook and Twitter as points of contact for UM-Flint–places to find information, ask questions, be a part of conversations, and connect with others. To show students how this can work, we aimed to engage them through Facebook and Twitter throughout the Welcome Back Picnic day. Also at the University Relations table, we gave away free car decals and temporary tattoos. We sold our limited edition black UM-Flint t-shirts. And once we had students at our table, we talked to them about social media. “Did you know UM-Flint is on Facebook? Are you on Twitter?” In addition, at our table and all around the event, UR staffers took photos of students and told them they could find them on Facebook. 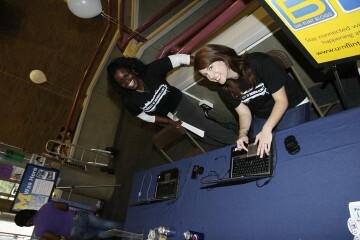 On the UM-Flint Facebook page, we began posting regularly from the event location before activities even began. We posted photos of students decorating, equipment being set up, and more. Once things were officially underway, posts were more informational–updates about food, giveaways, activities, etc. We found that photos being posted were viewed and tagged almost immediately! We’ve been pleased our progress on Facebook, but we were surprised by the level of interaction that day. The photos posted from the Picnic received a total of 1,139 views in that single day and 349 views the day after! As a point of reference: the day before the Picnic, UM-Flint’s photos on Facebook received 14 views. As you may know, UR has recently embraced Twitter. Our efforts to respond to followers, participate in conversations, and spread our brand message seem to be paying off. We weren’t sure, though, how successful we’d be using Twitter during the Welcome Back Picnic. Despite our attempts to spread the word about the #umflint hashtag, there was no way to know how many students received that message or would be tweeting from the event. There were small victories that day. Our average retweet percentage typically ranges from 2% to 4%. Of the 31 tweets from @umflint (UM-Flint’s Twitter account) on September 16, 11 were retweeted. That’s 35%! A few students, staff members, and one alumnus corresponded with @umflint directly. Through Twitter, we answered questions about t-shirts, food, and activities. Perhaps the biggest achievement, though, was the small evidence that the #umflint hashtag is catching on. Tweets from the students we interacted with that day were tagged. Tweets from the The Michigan Times (@mtimes) were tagged. And we’ve seen an increase in usage since the event. Our hope is that the #umflint hashtag will eventually provide users with a steady stream of conversation related to UM-Flint, made up by the university, students, alumni, faculty, staff, and community members. It seems that we’re doing a good job of connecting with our students through Facebook. Anecdotal evidence shows that a large number of our students are active on Facebook and are more familiar with how to use it. On the other hand, we have a way to go to reach our Twitter potential. While many of the students at the Welcome Back Picnic saw our signs about tweeting with the #umflint hashtag, many of them weren’t sure what a hashtag was. Perhaps we need to help explain the benefits of Twitter and using hashtags. Or maybe we can teach by setting the example; if we do more tweeting from events like Welcome Back Picnic, the practice may catch on. In any case, we felt that our exercise in social media from one of UM-Flint’s largest student life events was a success. Students at the Welcome Back Picnic either learned how to connect with us through social media, or used resources they were already aware of in a new way. We’re looking forward to posting and tweeting from future events!